Have you ever been chatting with someone and learned that they do online work as well? Your conversation suddenly fans wide open into a myriad of conversation topics: platforms, audience engagement, google analytics, Instagram hashtags. There is also the deeper component of our online work that we might be able to discuss. You know, how to handle sharing about our friends or family. Keeping our motives in check. Believing in the work we do – those heart issues that are the rudder to our big social media ship. Yet, some of us never get a chance to have these conversations, online or offline. Many of us working in social media have troubles being…well, social. But when we step out there and start a conversation we realize that the online space is jam-packed with potential colleagues, mentors, and friends. We realize that we need one another. We are all part of multiple Facebook groups. We join these groups hoping that we will find a place to learn from one another, to get support when we have a tough issue, to find others to collaborate with. But we often find that we remain on the sidelines. The engagement isn’t there, the relationships are superficial, the value is hit and miss. Eventually, we just have a cluttered social media feed and still no positive meaningful relationships we can depend on. Rather than hopping about looking for ‘that’ group, we need to stop and become active and engaged in just a couple of places/groups rather than remain a spectator of many. 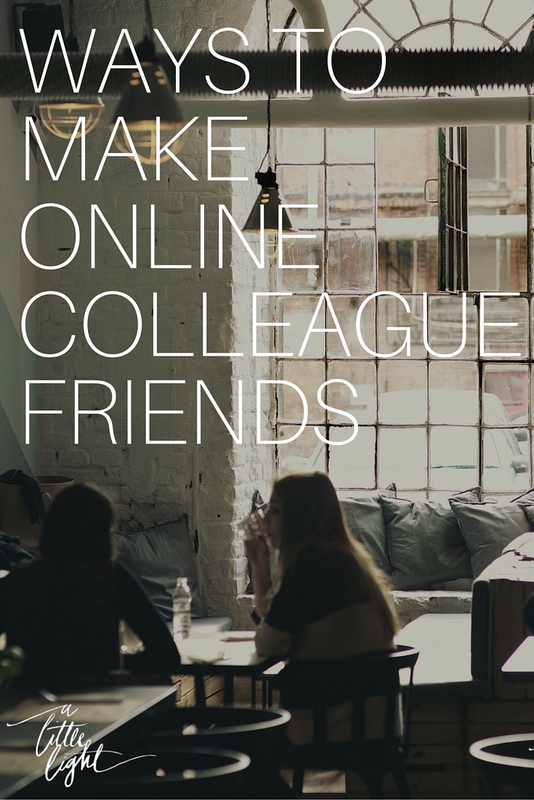 When we stop waiting for community to happen to us and become very intentional about finding online colleagues we can find relationships that help us to grow and learn. Ideally, we find friends. People who can keep us accountable, check in on us, send us quirky posts that make us smile. People we can message when we are still up at 11:34pm having a blogger crisis and trying to perfect our About Me Page or redefine our niche. Sometimes we don’t even see how much we need another friend until we have them. Relationships take your own investment into another person. It means being curious and caring about them and dedicated to spending time with them. If you want to get serious about building up your online community of friends and colleagues, put some thought into it. Whenever possible, meet people in person. Nothing beats face to face! It can be very easy to get stuck in a bubble when working online. We might even think that the online space is separate from God’s purview. But social media is meant to be social and the online space is a still a form of community. The value of a God-willed community is not withered away because of some filters and emojis. So let’s be intentional and invest in being online friends and colleagues because people are what matter most in this online space.